If you’re a foodie with an ounce of pride in what you eat, and you are anywhere near Suwanee, a suburb north of Atlanta, then you need to run, not walk, to Cafe Gourmandises. Seriously. It hasn’t gone away, and it continues to produce some of the finest food value around. Staff? Ridiculously amiable and chatty. The chef? The most approachable guy this side of Guy Wong. The food? Terrific. 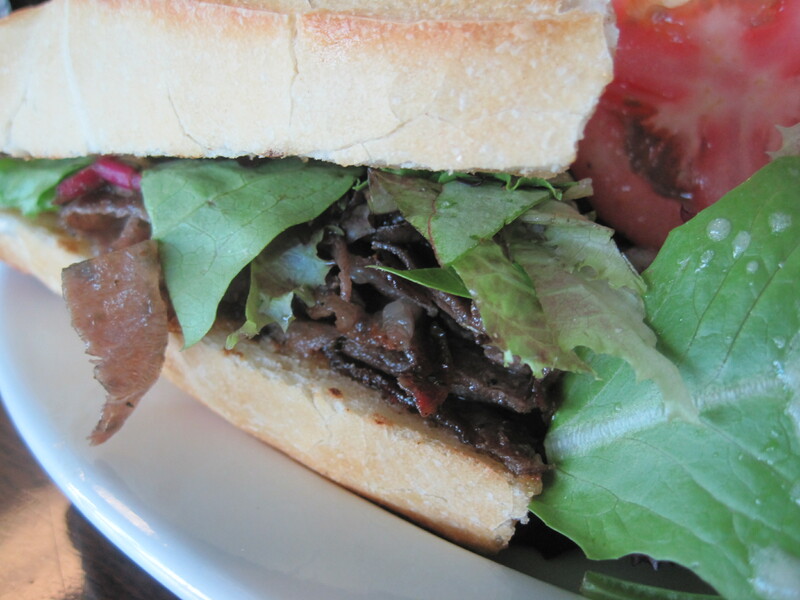 The shaved and crispy lamb sandwich is to die for. I snuck in for lunch recently. My daughter had the shaved and crispy lamb sandwich, and I had their Kobe burger. And perhaps I’m spoiled, as decent burgers for me are just a couple blocks away, but the lamb was definitely over the top. And as good as the lamb is, I don’t think I’ve ever eaten the same thing twice in this restaurant. We’ll be back. My wife now recalls this place and I’ll need some excuse to get her here. 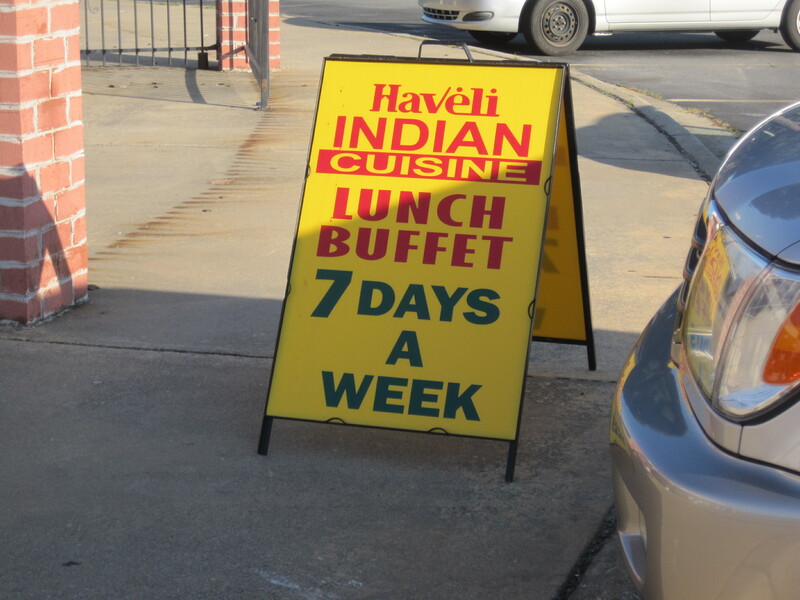 Haveli Indian Cuisine is part of a small Atlanta chain of restaurants, unnoticed by newspapers and social media. I’m not sure why. Lively spicing and rich flavors are the hallmark of this restaurant, along with a tendency to cook their foot on the spot — though these days they do have lunch buffets. Photo taken when Haveli was first opening. Outside sign of more recent vintage. 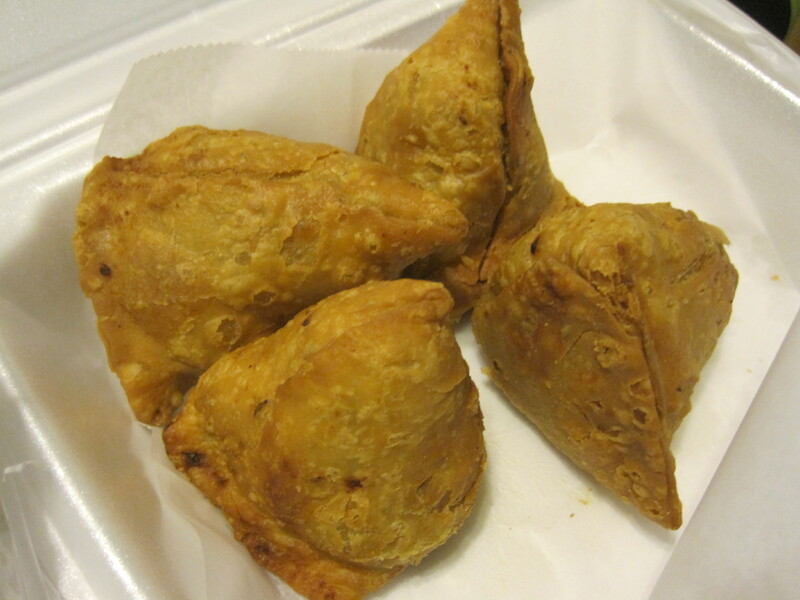 Their samosa have a kick to them and are good eaten in or takeout. 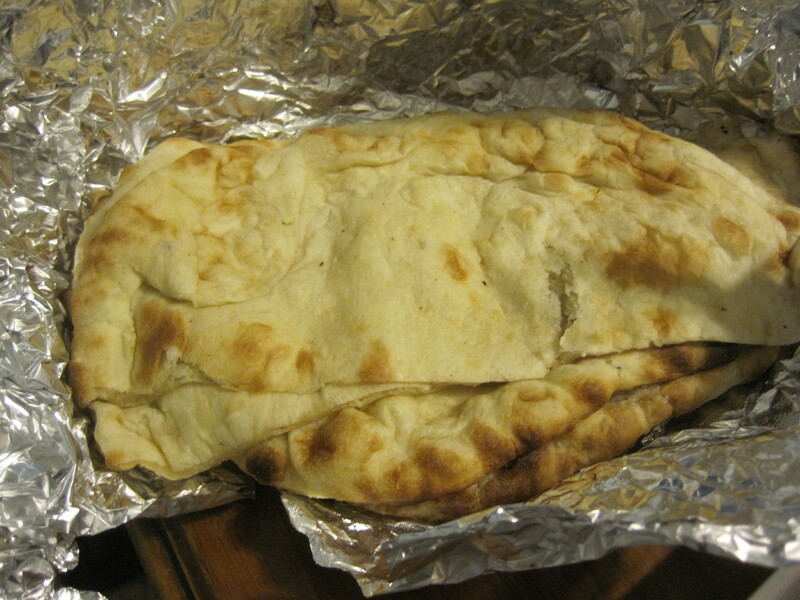 Their naan isn’t bad either. 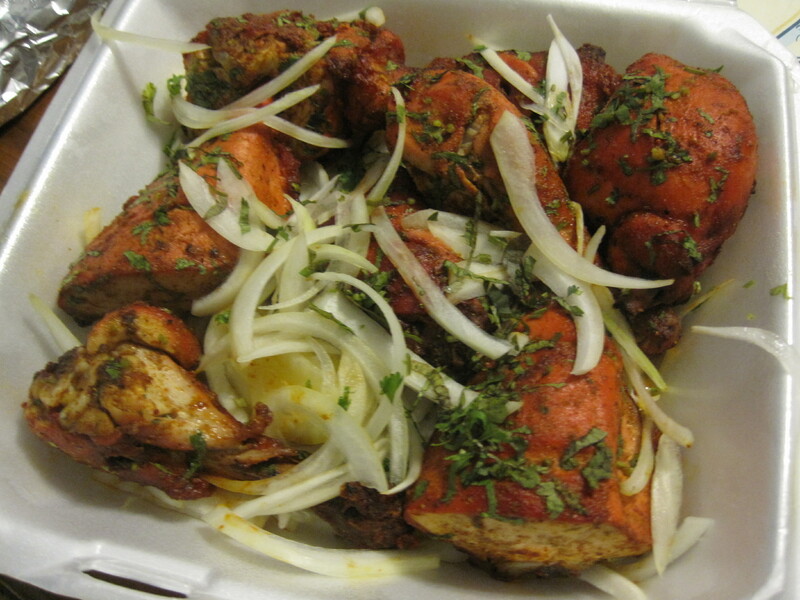 Tandoori chicken and tikka masala work well here, and Haveli’s curries have some kick to them. They have a dish called a jalfrezi which seems an Indian equivalent of ropa vieja, rich in tomato flavors and really worth some consideration. 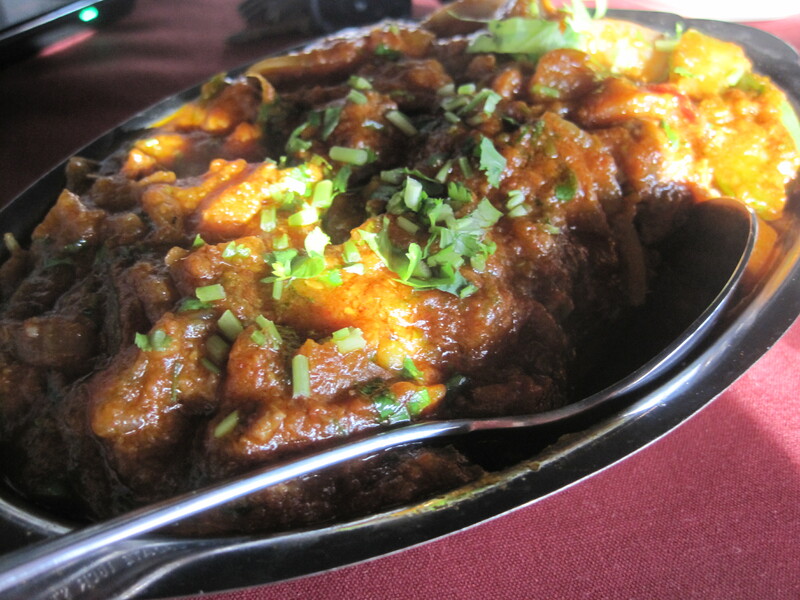 Lamb jalfrezi. I really enjoyed this dish. 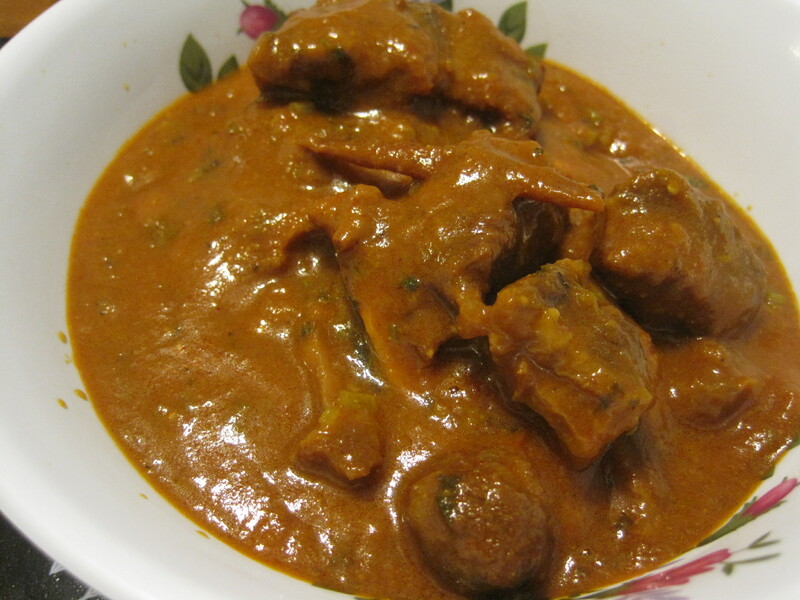 Mutton curry. Earthy meat with some bones, sauce has some spice. I’ve eaten in and taken out, both more than once, and right now, I’m tending to eat out more than in. I like the staff, sweet natured generally and helpful. The inside is serviceable instead of pretty, and has the feel of a restaurant still ironing out their kinks. On occasion they lose their air conditioning. I would call ahead if you’re considering dining in. 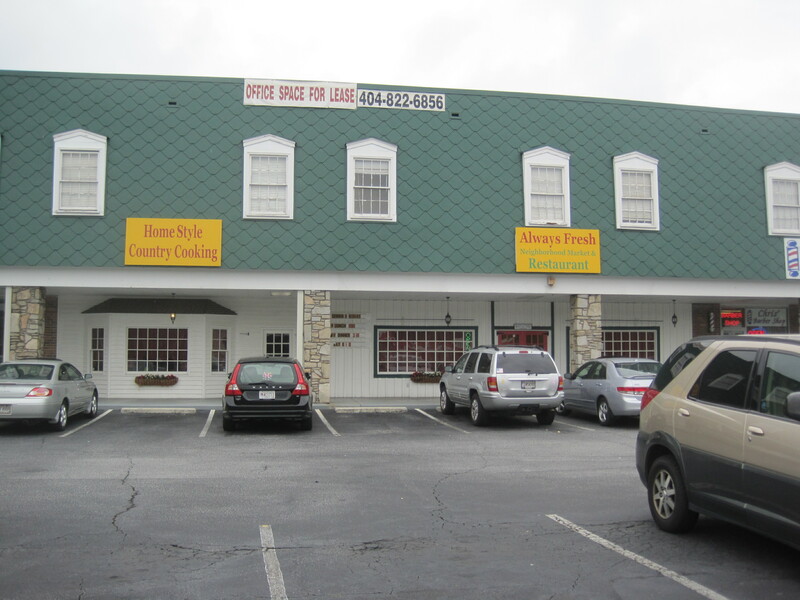 Always Fresh is a meat and two place near the corner of Five Forks Trickum and Rockbridge Road, a few feet away from Colossus Family Restaurant. The focus is on “the everyday family cooking that we grew up with”, and the simplicity of the menu bears that out. They have a rotating menu with different meats offered each day, different sides offered each day. If they don’t have collard greens one day, perhaps they have them the next. My daughter and I came on a weekday to try it. 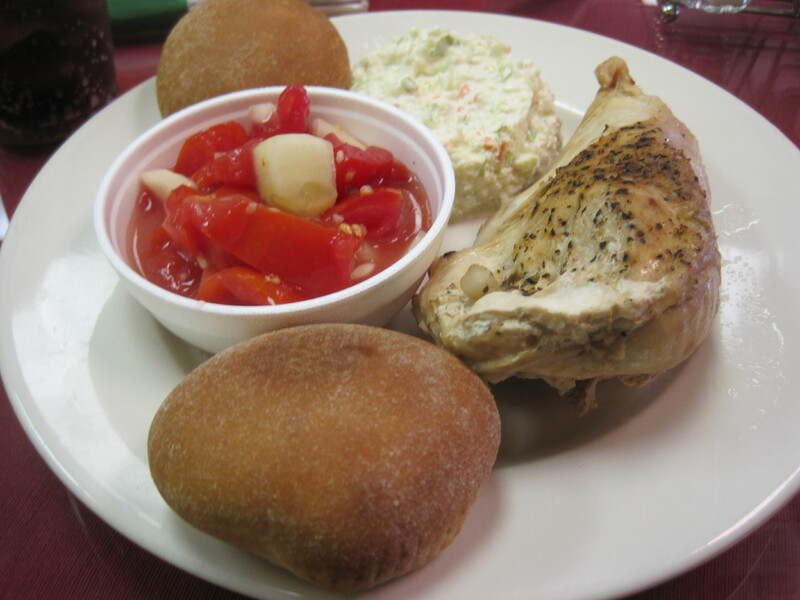 I enjoyed my baked chicken, though I wish I had shown on a day when they served greens. 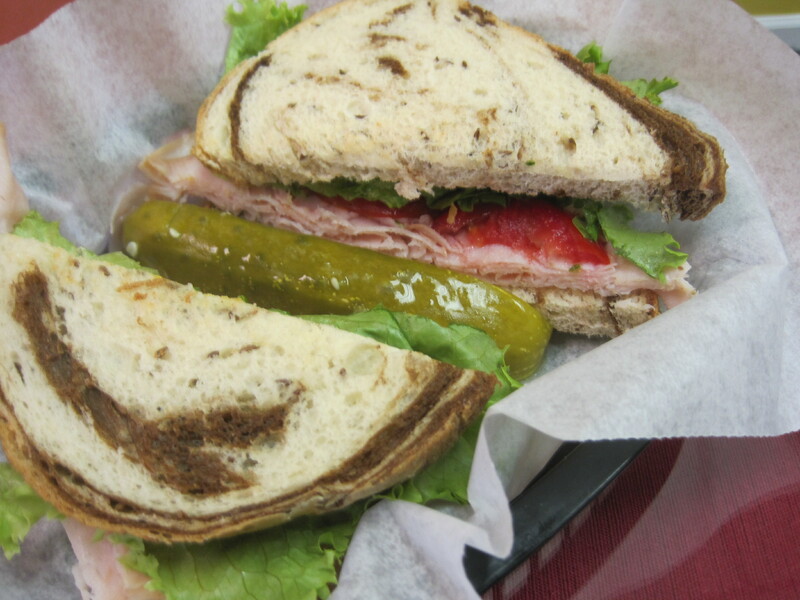 My daughter had a turkey sandwich which she enjoyed (besides a meat and two and a four vegetable plate, there are sandwich offerings as well as burgers here). Service was good, and in my opinion, the reason to come. The local buffets offer similar food, but places like Golden Corral tend to be crowded affairs, elbows into the sides of others at tables and really no one to talk to about your meal. Service here, for us, arrived early and was often around. On point gumbo. Po boys, enormous and good. 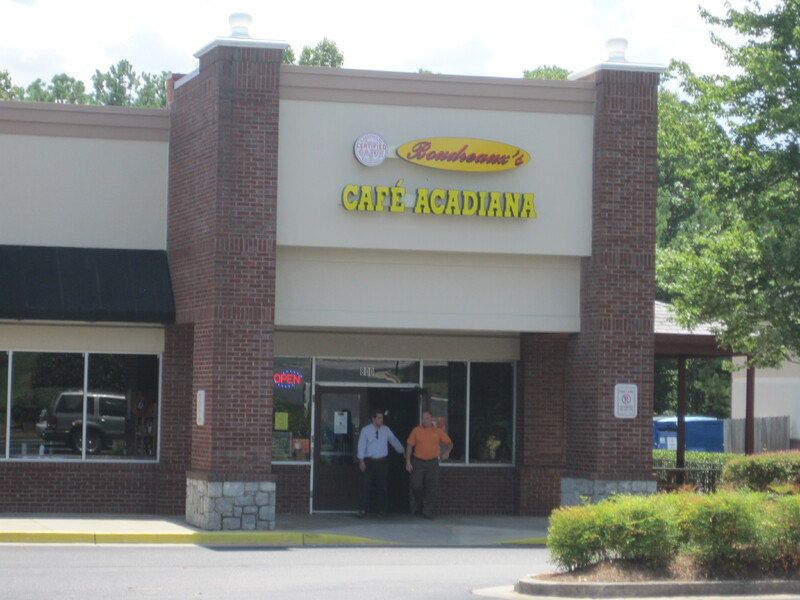 These are just two of the reasons to go to Boudreaux’s Cafe Acadiana in Duluth. Reasons not to go? Well, I found out I’m addicted to crawfish fat, and a shrimp étouffée, as opposed to a crawfish étouffée, doesn’t quite do it for me. 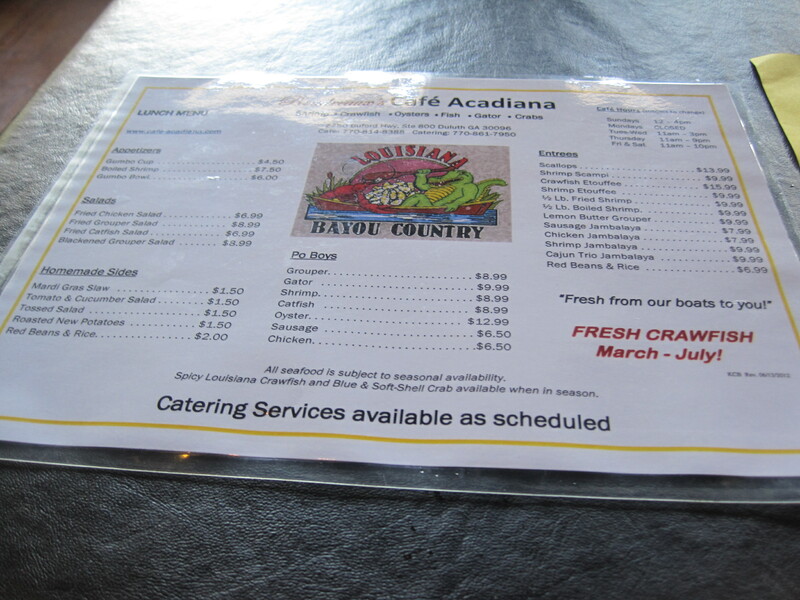 That said, the one cuisine that I eat at and refuse to blog most is Cajun. There are a plethora of Cajun/Creole/New Orleans restaurants in Atlanta that do nothing but butcher the cuisine. Boudreaux’s is not one of them. 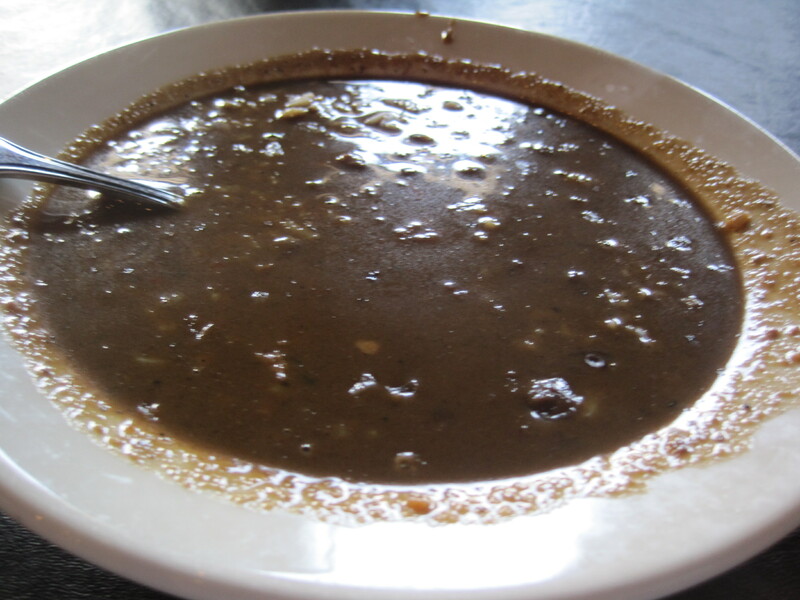 The gumbo has the best flavor I’ve tasted in an Atlanta gumbo since Benny’s Bar and Grill was active in my neighborhood. I wasn’t thrilled with the amount of filler compared to meat, but I’d drive half way across town for a broth this good. Highlights are the hit of the roux, the complexity of the pepper blend, flavors driven by black pepper aromatics as opposed to too heavy a hand on the red. 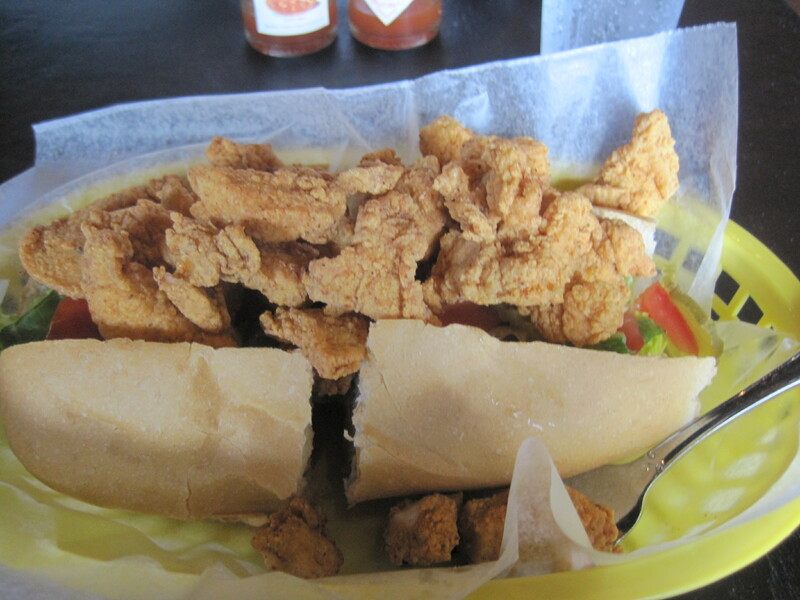 My daughter had the alligator po-boy and it was fantastic. Fried just right, and huge, we took half the sandwich home. This restaurant has a all you can eat catfish night on Thursdays, and it makes me look forward to trying one of those, sometime. 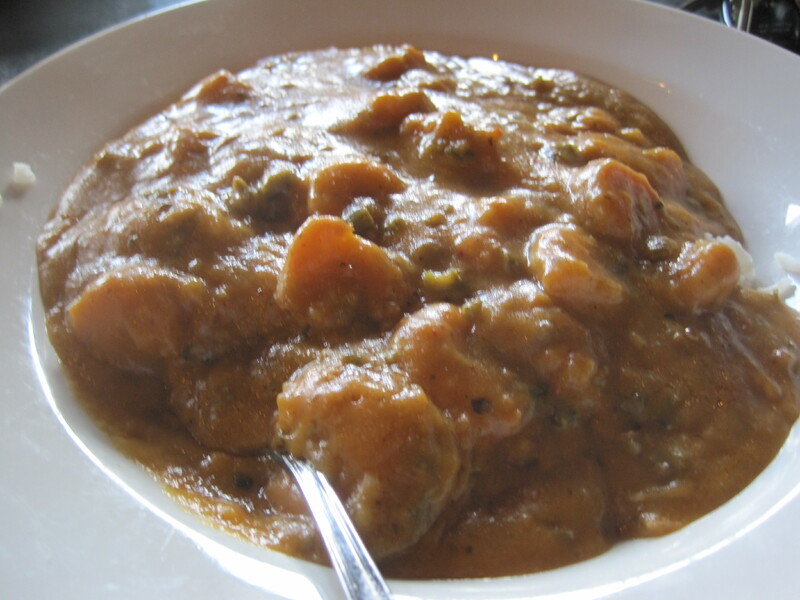 Shrimp étouffée? All I can say is it doesn’t have the flavor highlights of the crawfish kind. It’s probably the crawfish fat that’s doing it to me. What I ate was good enough, but not that heavenly bliss I get from fresh crawfish, properly spiced, in a superb roux. Boudreaux’s evidently boils crawfish on weekends when they are in season. Check out their website for more details. 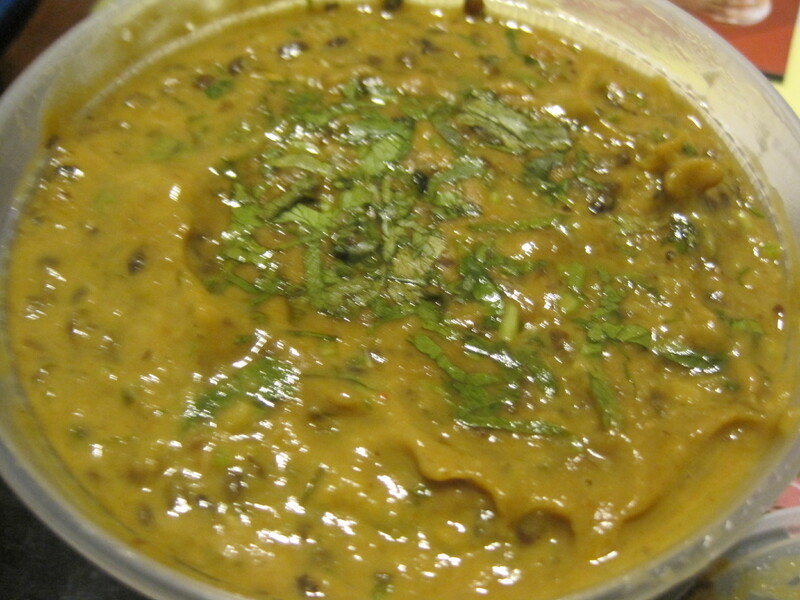 Two interesting reviews, with perhaps different opinions of the restaurant, are here and here. 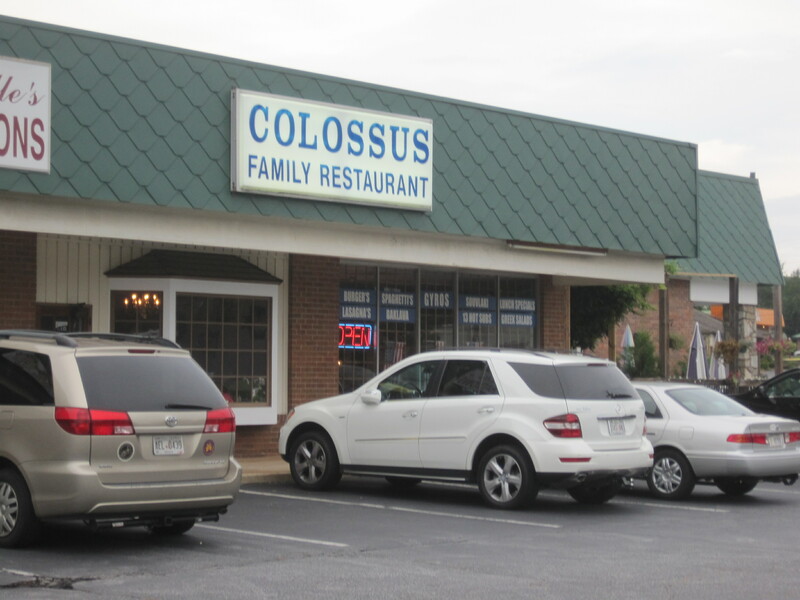 Colossus was a surprise to us, offering far better Greek food than we expected. 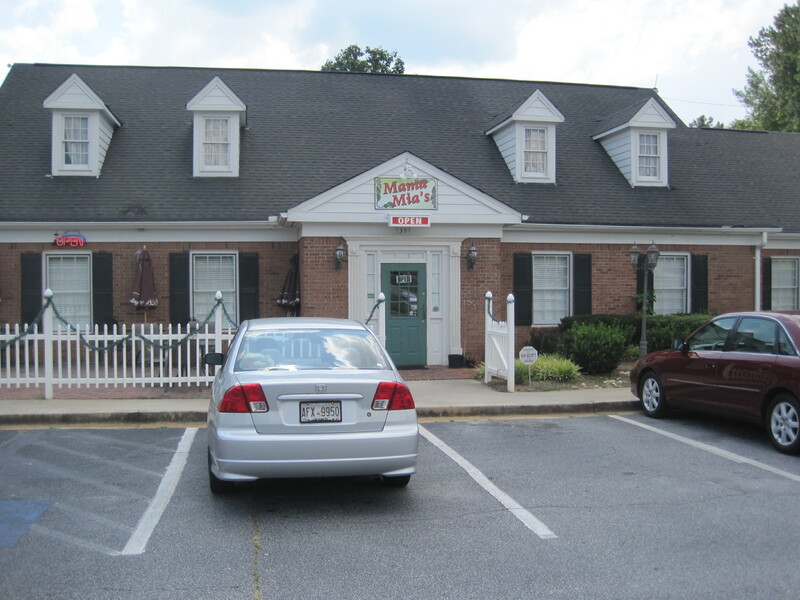 Clearly a superior choice for dinner, I’m very tempted to claim it’s the best Greek within half an hour of Snellville. As our overall experience with Greek cuisine is neither broad nor exhaustive, I’m also happy saying take any of my claims with a grain of salt. Still, I’d have no qualms taking out of town guests to this restaurant. 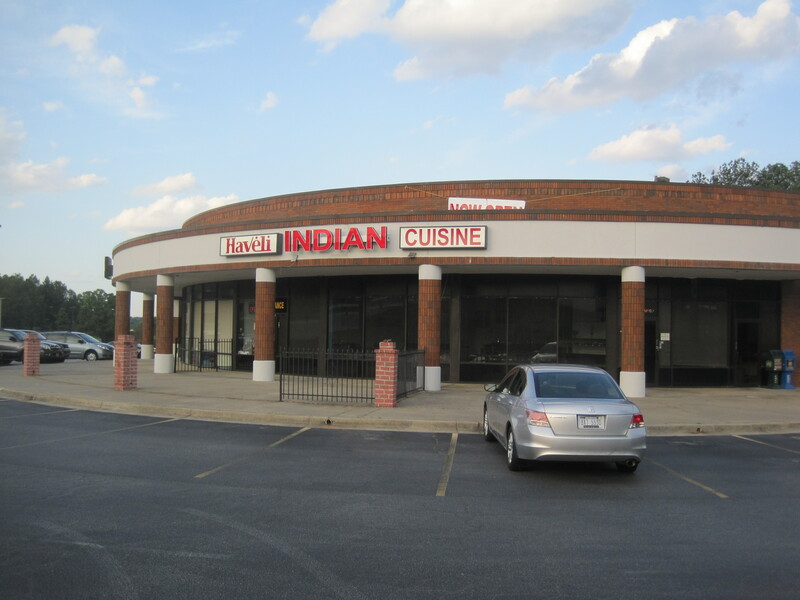 It’s perhaps the largest restaurant near the corner of Five Forks Trickum and Rockbridge Road, on the right as you’re heading south down Five Forks, and located a bit before the intersection. Inside, the restaurant is longish, as opposed to square. Staff were wearing black tops and the men were wearing baseball caps when we arrived. There are tables and booths, and as the eatery is thin and one side has good windows, if you love light you can get plenty of it. My wife ordered pizza, I ordered the Greek plate and my daughter ordered the Moussaka. 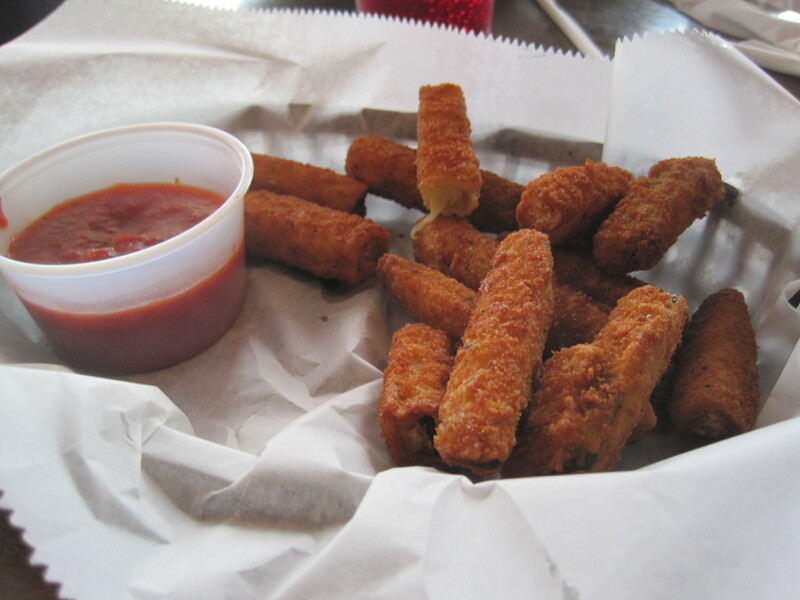 We ordered salads and appetizers, some fried zucchini. The fried zucchini was excellent. 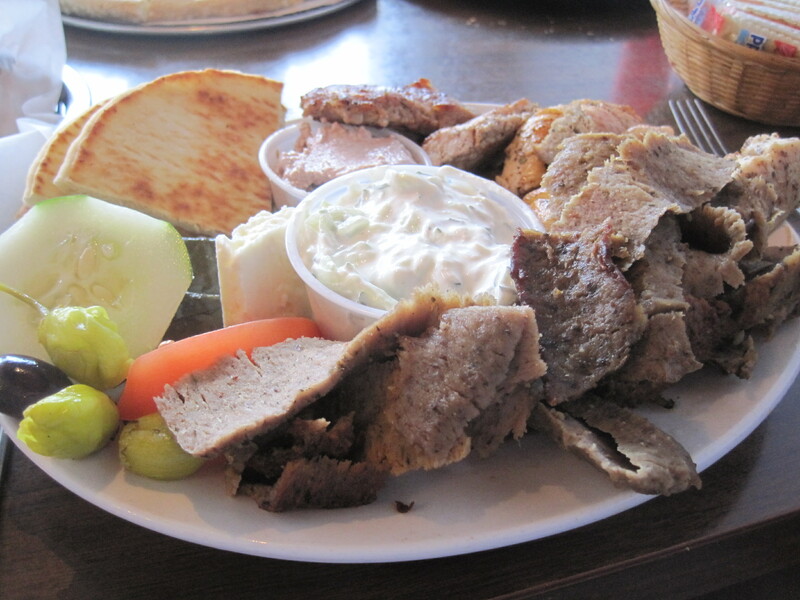 The Greek plate is a tasty meat paradise. Moussaka. The hit of the meal. Of the entrées, the pizza had no crust to speak of, except at the edges, just a floppy “suburban special”. But the Greek food was superior and impressive. 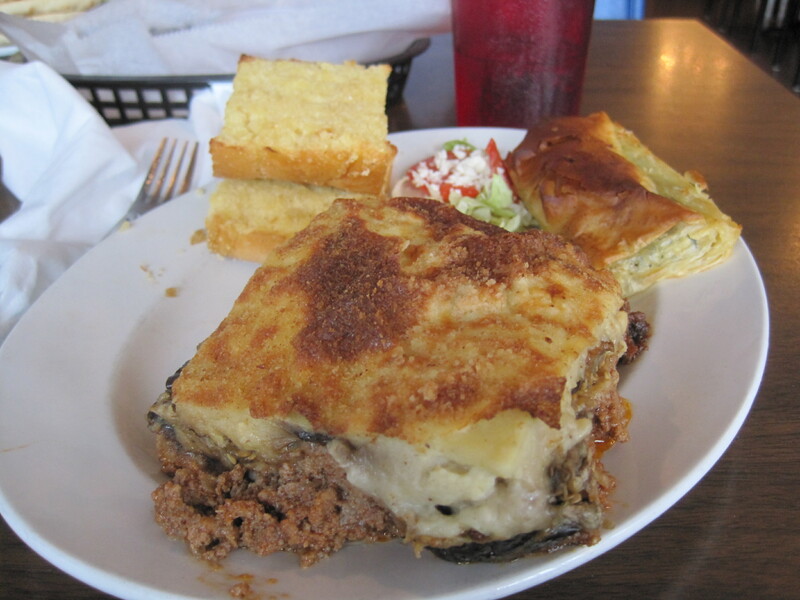 The Moussaka was the hit of the table, something I expect we’ll be ordering again and again. The plates were enormous and we took back food from almost every entrée we ordered. In conclusion? This is a place we’re likely to go back to. Overall, we were impressed by what we ate. This restaurant is a keeper. Reviewing Cioffi’s has been a bit like a Monthy Python skit. I would come for the pizza, and the people manning the ovens would be novices. I would get floppy pizza. I would come again. 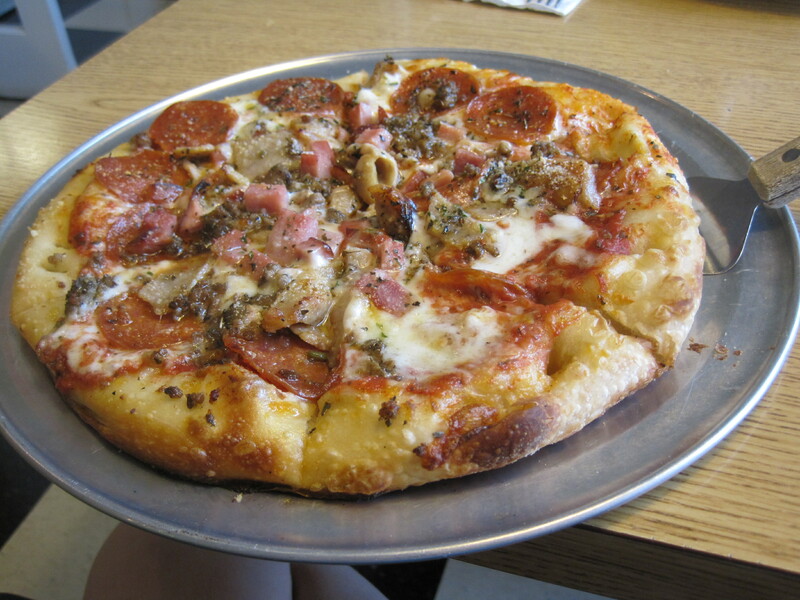 Teens were manning the ovens (or perhaps they just looked young) and I would get a “suburban special”, a pizza with too little char and stiffness, and a little overloaded with ingredients, leading to softer, wet crusts. Listen, lad, I built this kingdom up from nothing. All I had when I started was swamp … other kings said I was daft to build a castle on a swamp, but I built it all the same … just to show ’em. It sank into the swamp. So I built a another one … that sank into the swamp. I built another one … That fell over and THEN sank into the swamp …. So I built another … and that stayed up. 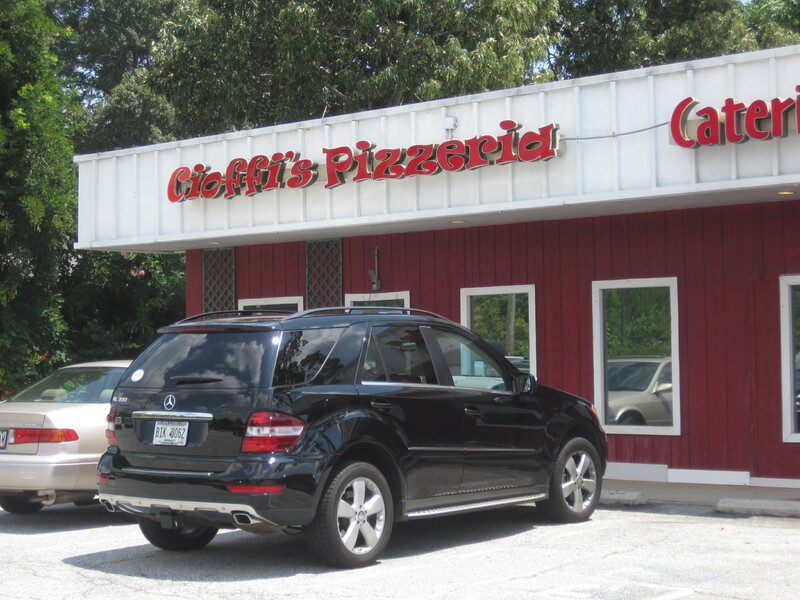 Some years later, I’ve found a much better way to drive to this section of the world, and I gave Cioffi’s yet another try. This time, yes, I can see a pizza worth writing about. Of course, it’s my daughter eating it. With my physical issues, I’m best sticking to sandwiches these days. 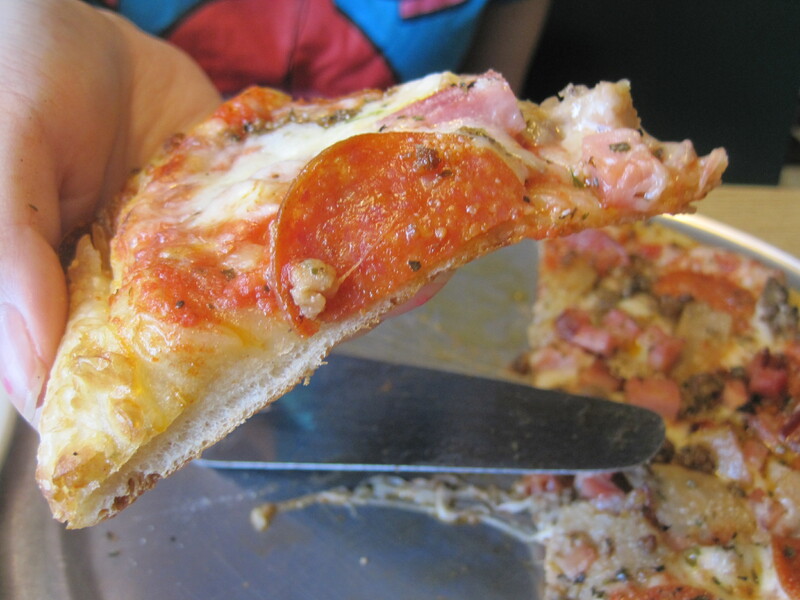 A respectable crust, and more flavorful than chain pizzas. We came at lunch and in general found the lunch specials not all that appealing. My daughter likes meat pizzas, and my recollection was that Cioffi’s did have a reasonable personal sized pizza. I ended up having an Italiano sandwich, she had the personal meat pizza. These we ordered off the dinner menu. Asked to rate the crust, my daughter gave it an 8, and said it actually had some flavor. 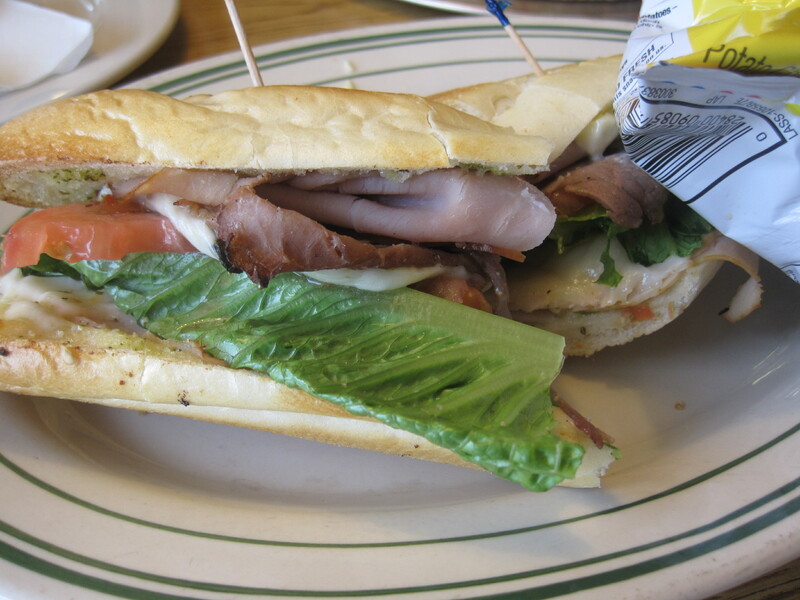 The sandwich had a nice crusty bread and good meats. It was certainly worth the money I spent. I’ll note some changes on the inside. It’s a bit more sedate, less focused on the local school. A middle aged gentleman manned the oven, and one staffer waited tables. They still had beer taps on the far side of the eatery, and the best beers provided are those on tap (a Terrapin selection caught my eye). Veridict? A generally good eatery, but my personal experience with these pizzas has been hit or miss. I’m much better with hits when veteran chefs man the ovens. Rather than fight traffic down Highway 78, it’s a much easier drive to get onto Five Forks and head past Killian Hills. A few minutes later, you’ll run into the intersection of Five Forks and Rockbridge Road. Turn right and look to your right almost immediately. Cioffi’s is up on a rise just past the turn. 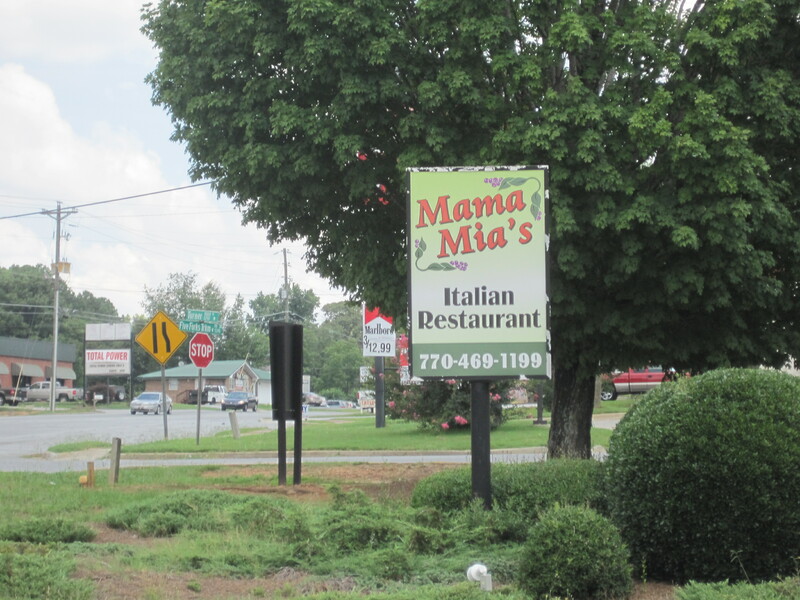 Mama Mia’s is a basic Italian eatery carved out of an old Bank of America building near the corner of Rockbridge Road and 5 Forks Trickum. This corner has a number of eateries, but I had Mama Mia’s pointed out to me by a someone working on our air conditioning one day. They said it was a terrific place to get a cheap lunch. Recently, we tried Mama’s out and have to agree. The sign is hard to see heading down 5 Forks from the Snellville area. The tree blocks the view. The inside is pretty roomy, with a bar on one side and booths and tables scattered about. The air is informal and comfortable. In the bar I saw perhaps 4 taps, one of which was serving New Belgium’s Fat Tire. 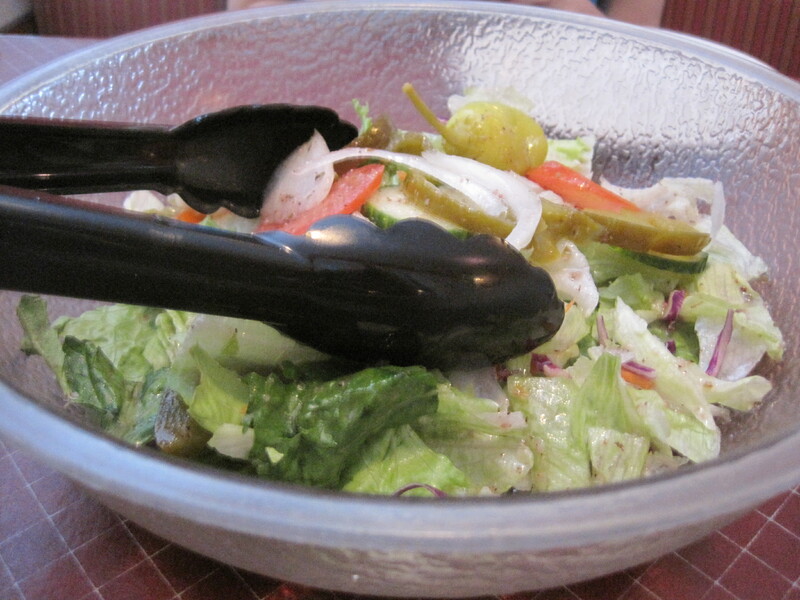 If you purchase salads, they will be served in a large bowl and can be shared. 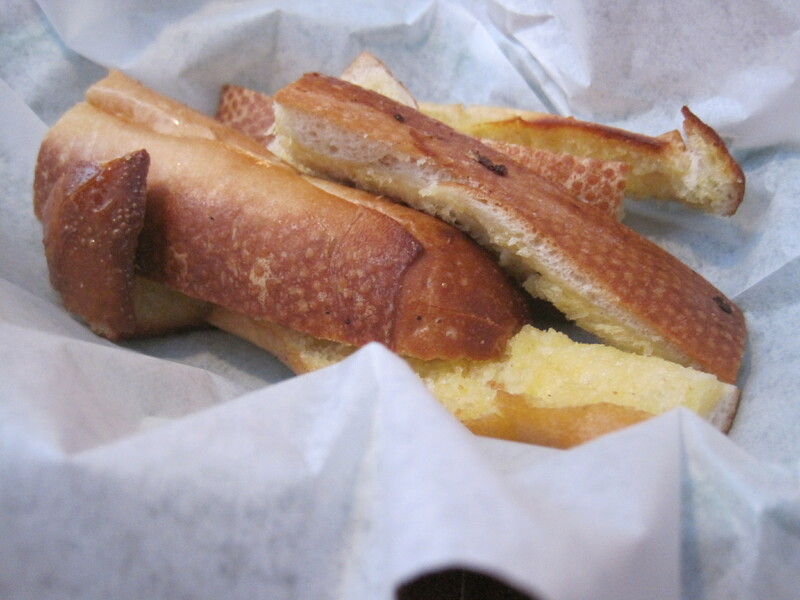 Garlic bread came with our meal. 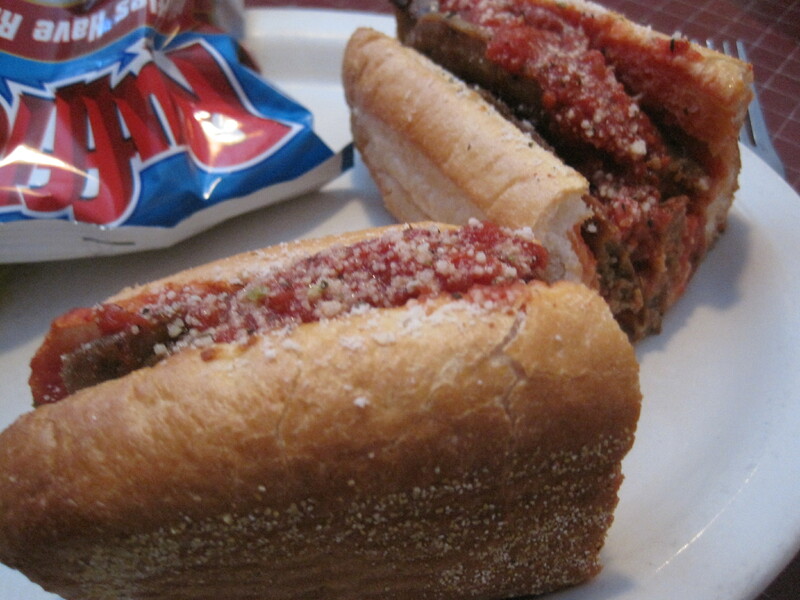 I loved my Italian sausage sandwich. 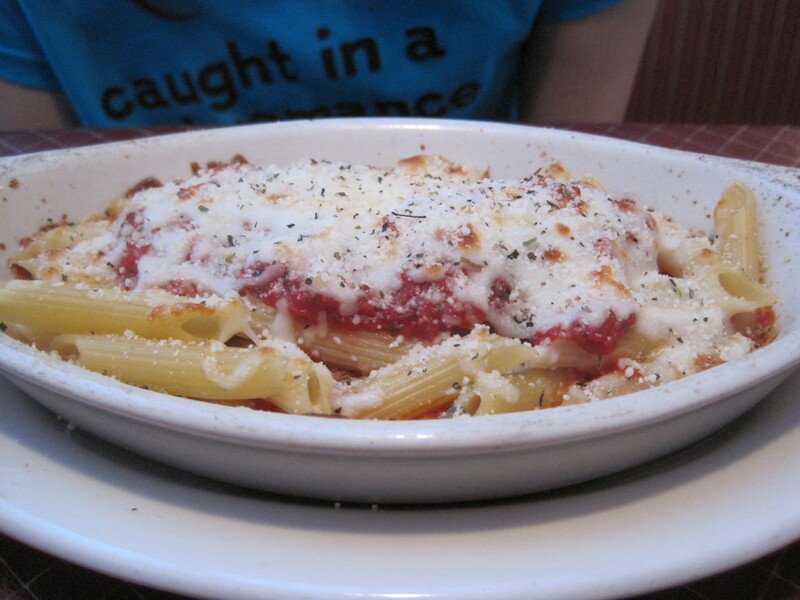 My daughter enjoyed her baked ziti. Lunches are all less than 10 dollars and pretty no frills. 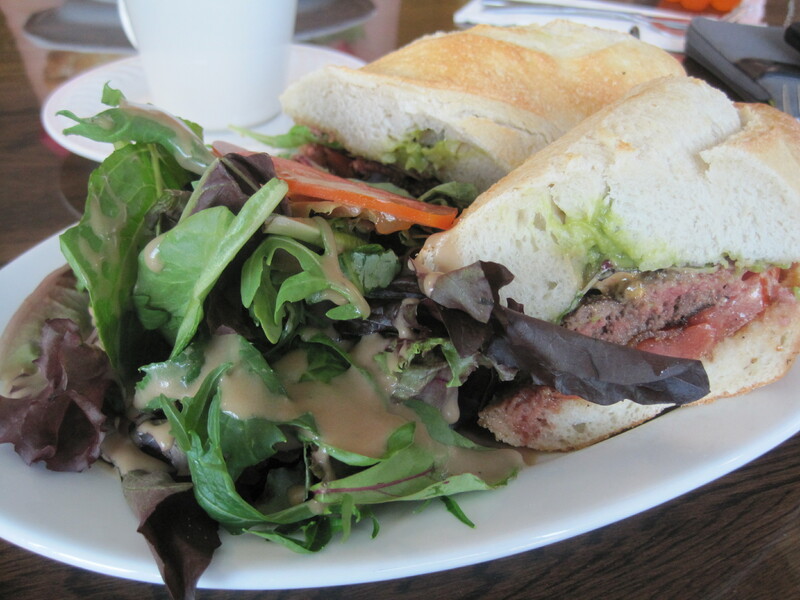 While the lunches are pretty basic, dinner can be more sophisticated and prices are higher. Still, I suspect Mama’s is the kind of place my wife would like. The odds we’ll be back are pretty high. Tip: because the building is carved out of a former bank, it has a protected drive-through window. You can call in orders to be picked up. There are a couple ways of getting here from Snellville, but I recommend going down Five Forks Trickum. You can get to this place heading down 78 and exiting near the Wall-Mart, and then heading down Rockbridge, but I think getting onto 5 Forks from Ronald Reagan, or Oak Road, or Killian Hills is a better local solution. The ride is much simpler. If you do this, Mama Mia’s will be on the left a half block or so before the intersection of 5 Forks and Rockbridge. 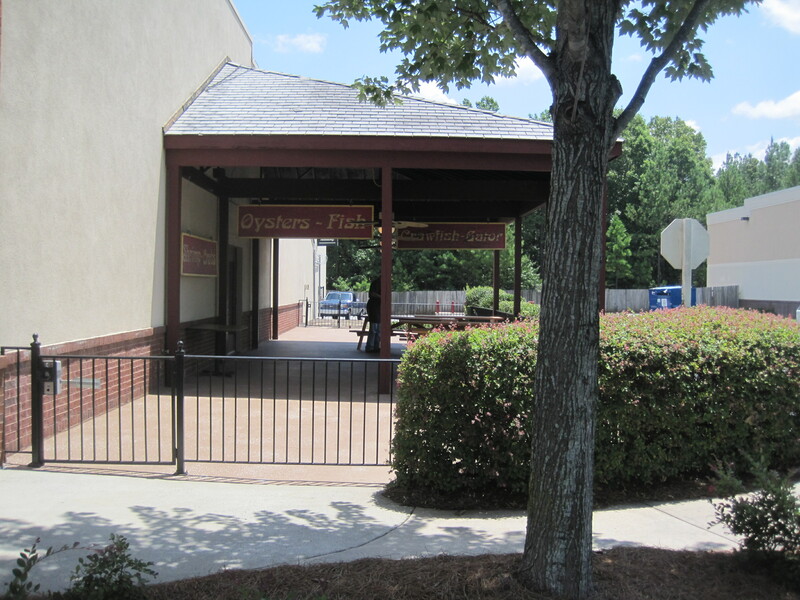 Your view of Mama Mia’s is partly obscured by trees, so be warned.